Most of the time we end up giving up on our weight loss goals. Coming to think of it, it is actually our unrealistic expectations that makes the process look harder and unachievable. Weight loss may require changing our lifestyle to a great extent (which is often easier said than done). You cannot do so without making a few compromises. The trick is simple – No pain equals no gain. Losing weight is not always about stocking up on diet foods and hitting the gym (Fit O’ Clock – best gym in Jaipur). We have come up with 10 easy ways that will help you achieve your weight loss goals in no time. Knowing about your body weight is both important and crucial when it comes to losing body fat. There is a simple formula to find out approximately how much should you weight. For women: IBW= 45.5 kg + 2.3 kg for each inch over 5 feet. Going by this math, if a women is 5’6” tall, her ideal body weight should be around 59.3 kg. However, this is just a rough estimation. For a more accurate number, you can always consult your fitness instructor or your doctor. Figuring out your IBW really helps in putting things into perspective which is turn shall influence your weight loss goals. Pitch your body a realistic goal. Ask yourself why you want to lose weight. Is your vision athletic, aesthetic or both? This will give a firm direction to your goal. Have a mental picture of your end result to keep you motivated. Most people never really care to focus on their goals. They miss workouts or switch programs every few days. Fitness is all about figuring out what you want for your body. You can choose almost anything and lead it towards a direction. Choose your food habits wisely. It can get tricky because having to eat the same food everyday can leave you demotivated. Everyday should be planned according to different eating patterns. Plan your work day, vacation day, or weekend in advance so there can be no excuses. But then again, do get too hard on yourself. You can totally customize your food habits when need arises (like for that surprise office party in your honor or the likes). Staying hydrated is key when it comes to achieving weight loss goals. It does not always has to be water. Replace your sugar-infused beverages with tea, or freshly squeezed fruit or vegetable juice. But when it comes to water, keep a bottle always handy. Drink water whenever you can and not just when you are thirsty. Have a glass when you wake up in the morning, a few glasses between each meal, a glass after meal and also during workout. Only your will power can help you ace this point. Especially when you are dieting, cravings come out from nowhere and soon you may find yourself nibbling on a bag of potato chips. Worry not! We have built a defense mechanism for you. Keep fresh cut fruit, vegetables with hummus or homemade popcorn in stock so that the next time you are hit by such cravings, you know where to go to. If you are on a vacation, holiday or during special celebrations, you are bound to enjoy a lot of calories. This can mean major setbacks on your weight loss spree. However, you can always bring about a balance by hitting the gym (Fit O’ Clock – the best gym in Raja Park , Jaipur) to burn those calories. For example, brisk walking or jogging for 50 minutes can burn off all the calories in a large vanilla latte with whipped cream or strength training of 1 hour and 30 minutes can burn snack-sized bag of chips. Keep detailed records of your entire goal setting and achievement process i.e. what are your doing every day and what have you achieved so far. It helps you stay focused on one hand and comes handy while planning your next step on the other. You can also keep a track of what’s working and skip what’s not. Make sure you are taking all the nutrition your body requires. Build a proper balance between meals and snacks. Remember, you need to feel full and satisfied after every meal. Your snack should be the ideal combination of protein-rich food with a nutrient-rich carbohydrate choice. Carbohydrates build your brain and protein repairs your muscles. Goals help you get results. Therefore, it is crucial too. Set goals that are possible to achieve. However, remember, if your goals are not keeping you motivated, they are not worth fighting for. Set short-term goals based on something that you desire. Take some extra time to prepare your list. Give yourself a reason to start each day. Eating healthy and being physically active is always good for your health. Try to set your goals looking at the bigger picture – beyond weight loss. Focus on feeling better and how to stay at the peak of your health at all times. Learn how to cook healthy or a new physical activity. These will keep you motivated and happy. Small changes in your daily routine is enough to lose weight than you do so by occasional dieting. 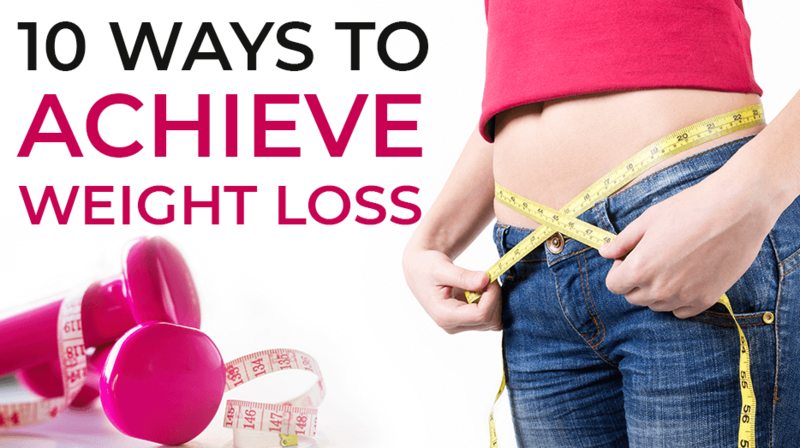 Hope these tricks help you to off load those extra kilos and achieve weight loss goals. Get Moving!